I don't think it's been mentioned here or on the main site yet, but I just found this bit of good news for John Noble fans. Just a warning: the linked article has some spoilerage at the bottom if you didn't see the season finale of Sleepy Hollow yet, so I'll paste the important part. 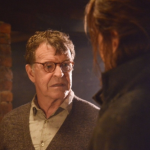 Fringe's John Noble is back on series regular duty at Fox. After a three-episode arc on the freshman season of Sleepy Hollow, Noble is joining the cast of the breakout drama as a regular next season. Also promoted to regular is Lyndie Greenwood, who plays Abbie's sister, Jenny. Sleepy Hollow has been a great show so far, and I've been loving Noble's turn as a Sin Eater. I'm happy that it's coming back next season, and that it's getting a proper full order as well.